Derbyshire have signed all-rounder Logan van Beek as their overseas player for the entire 2019 season. The 28-year-old New Zealander is available for all formats of the game. "We were looking for a specific type of cricketer, someone to enhance our bowling attack," said Derbyshire head of cricket Dave Houghton. Van Beek recently played for New Zealand A against India A, having previously represented the Netherlands at the 2014 ICC World Twenty20. 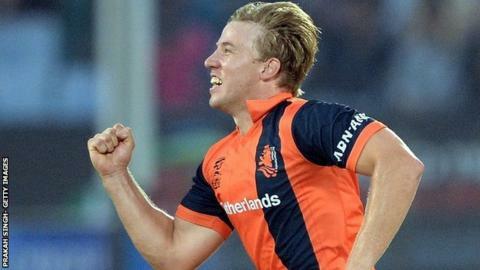 He took three wickets when the Dutch beat England by 45 runs in Chittagong. "Logan came highly recommended by our contacts in New Zealand," added Houghton. "He gets his wickets with balls that are pitched up and that's a good length in England, especially in the early season. "He's on the verge of New Zealand side and bursting to try and get in. That's the type of cricketer we want - guys who are here with a point to prove." Van Beek has taken 109 wickets in 39 first-class matches at an average of 30.33, as well as 61 List A wickets - and he has made 1,087 first-class runs. Meanwhile Derbyshire have released 20-year-old batsman Callum Brodrick by mutual consent.